Oh, how sweet it is to cap off a fabulous meal with something…spicy?! That’s right, folks. Here at Milagro, the decadent, the sweet, and the spicy strut their stuff together on the runway that is their dessert menu with punchy, spicy chocolates, rich and creamy caramels, and refreshing fruits with a kick of heat. 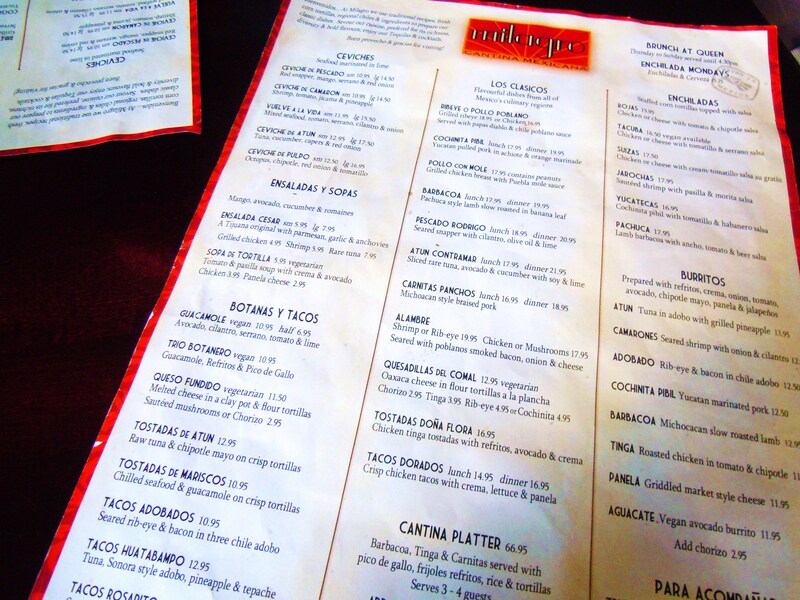 With such an impressive menu of regional Mexican mains and appetizers, I was beyond excited to dig into whatever they offered for dessert and to my delight, there were more than a few options to tantilize my taste buds! 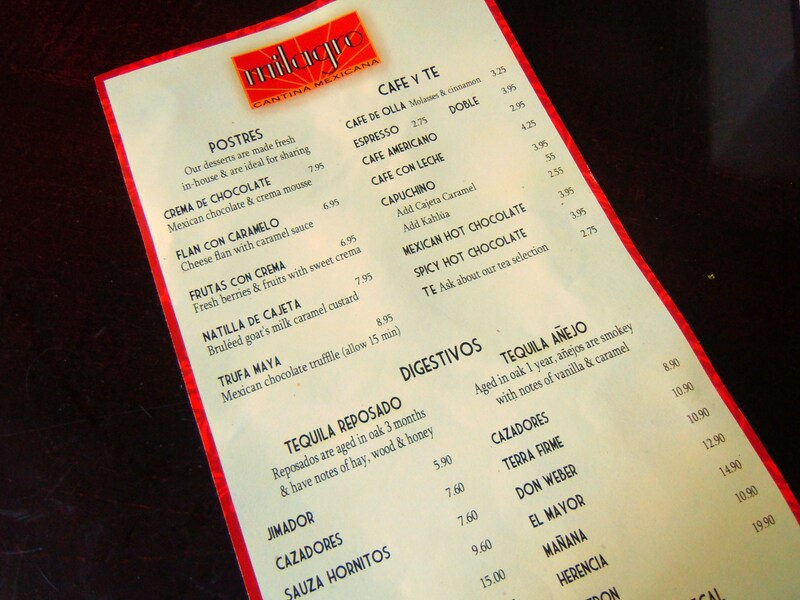 Milagro’s dessert menu is comprised of tequilas (digestivos for the end of a meal), coffees and Mexican drinking chocolate, and sweet and spicy dessert creations. Their menu lists 5 different dessert dishes (priced $6.95 to $8.95), but there’s actually 6 because one of them is a dessert special that changes on a regular basis, based on what’s in season and what’s appropriate for the season. On this particular day, Milagro’s special dessert was a juicy and refreshing homemade mango ice cream with chili peppers! I KNOW, you can’t get this anywhere else! And while it’s something you’d never expect, it completely makes sense because Milagro utilizies spices and manipulates heat in all their dishes to create food that is uniquely their own but still very much in keeping with traditional, authentic flavours and techniques that have deep historical roots in Mexican cuisine. The 5 desserts listed on their menu include a Flan Con Caramelo (cheese flan with caramel sauce), Trufa Maya (Mexican chocolate truffle), Frutas Con Crema (fresh fruits and berries with sweet crema), Natilla De Cajeta (bruléed goat’s milk caramel custard), and my pick, the Crema De Chocolate, a Mexican chocolate and creama mousse! Mexican chocolate is something you would find at ChocoSol in its raw, pure form, whether its in thick, round disks, as Mexican drinking chocolate, or in rich, delicious chocolate vegan cookies. The usage of spices (cinnamon, tamales, chilies, achiote, allspice, and others) is exactly what makes Mexican chocolate distinctive along with its natural, raw, dark bitterness. This uniqueness completely shines through via this decadent, velvety smooth dessert because only at Milagro will you find a dainty chocolate mousse that will bat its sweet eyelashes at you on the first bite and then turn around to give you a kick in the pants with a rapid succession of little bursts of heat! 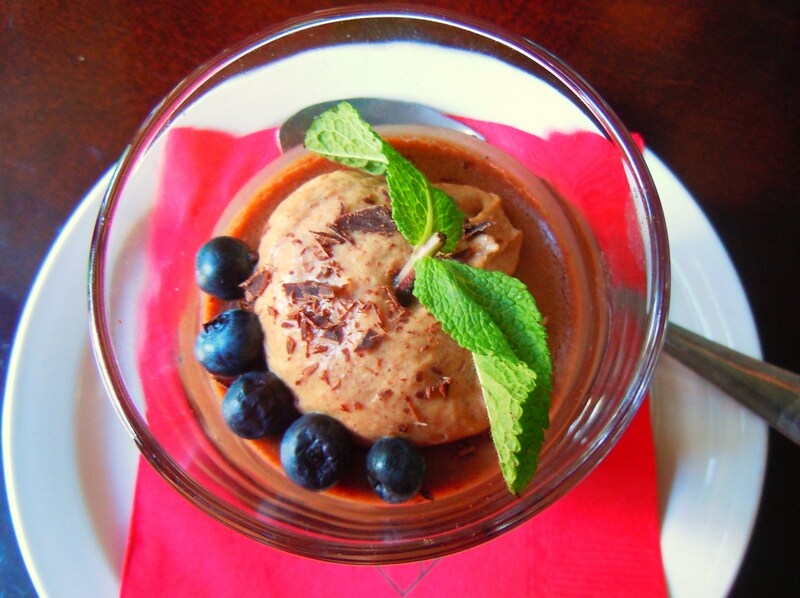 The Crema De Chocolate is a rich, velvety smooth Mexican chocolate mousse dessert with two layers of chocolate (one lighter, one darker), blueberries, a spig of mint, chocolate shavings, and – wait for this – Mexican chilies! 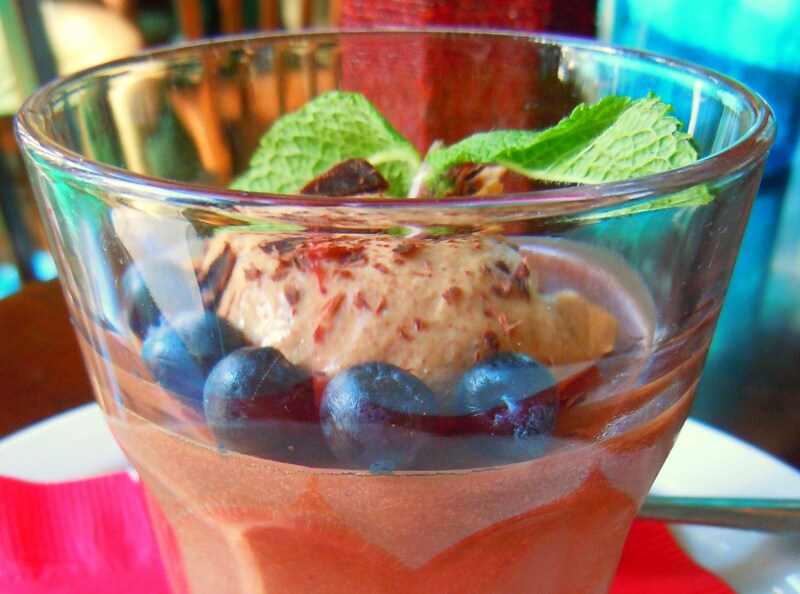 You have this glass filled with rich, creamy, airy mousse and as you’re spooning the delightful chocolate in your mouth, you get punched with tiny beads of chilies! Spicy chocolate may not be mainstream per se in Canadian cuisine, but is it ever a stand-by in Mexican. I’ve only ever seen spicy chocolate on The Food Network (one of the chefs on “Best Thing I Ever Ate” was raving about this spicy chocolate ice cream in the States) and at farmers’ markets where ChocoSol sells their 5 Chili Bullet flavour as part of their selection of Mexican chocolate. Otherwise, spicy chocolate has for the most part been unexplored terrain for me up until this point. 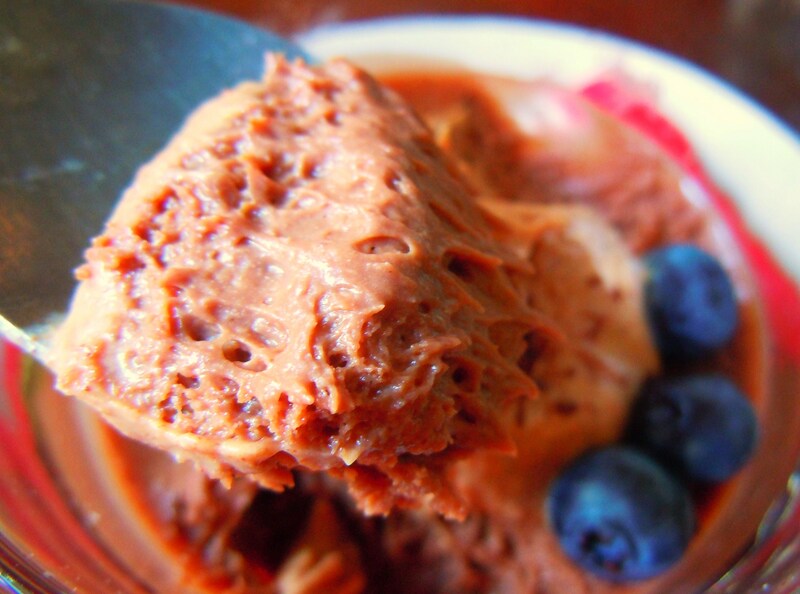 I tried to capture the texture of the chocolate mousse as best I could, but you have to taste it to truly believe it. The chocolate mousse is so incredibly nuanced in both flavour and texture and it’s unlike anything I’ve ever had. 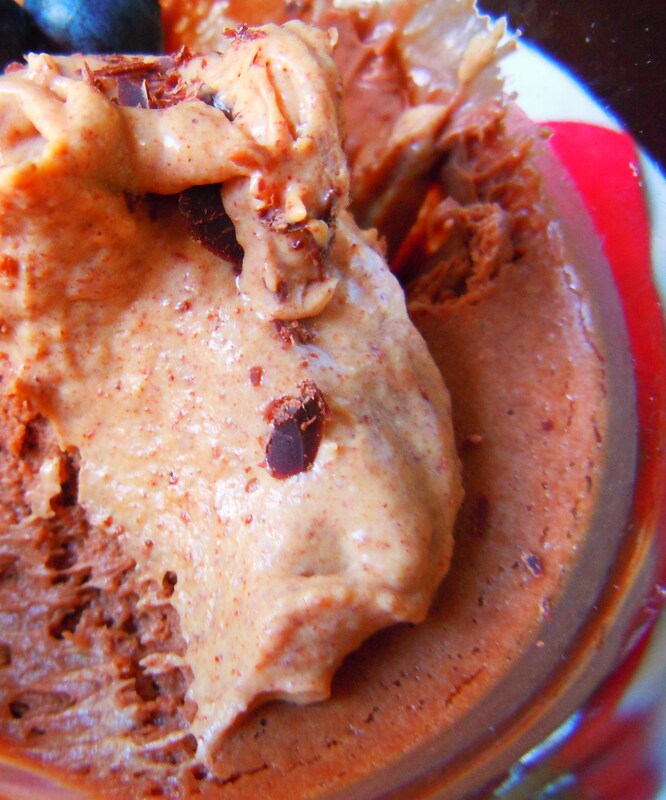 The mousse is so deliciously fudgy, cocoa-y, and creamy with that unmistakable bitterness that is inherent in real chocolate. 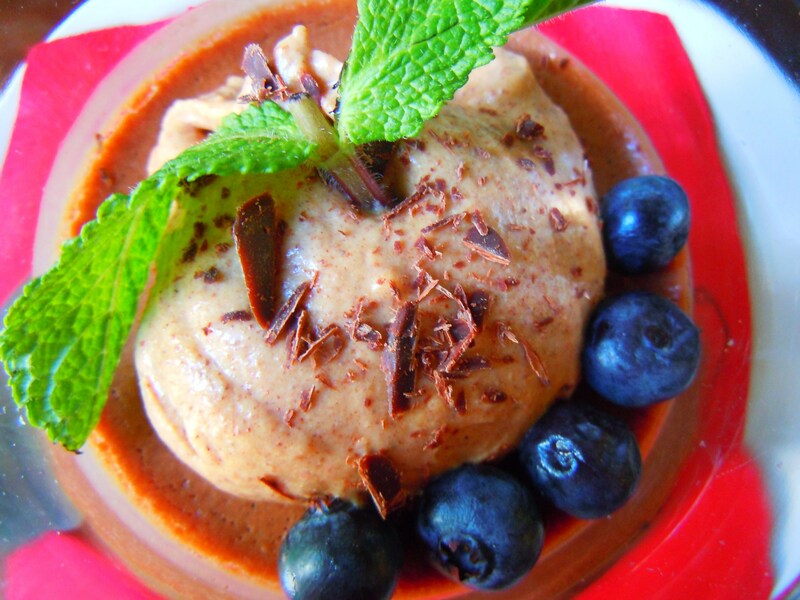 It is not a “sweet” dessert in the sugary sense of the word and it demonstrates beautifully how a dessert doesn’t have to be oozing with sugar to taste amazing. The texture is perfect because it’s not too thick and dense but it’s also not too airy; it has substance and body to it so that it actually sits and melts in your mouth, letting the flavours sink in. And the chilies! All throughout the dessert there were the tiniest of red beads and they gave off little bursts of spiciness and heat to kick the chocolate mousse up a notch. The level of spice wasn’t overwhelming and I really think the creaminess of it mellows everything out, from the chilies in the dessert to the spices that might still be lingering from the scrumptiousness of dinner. It’s a dessert that has so much flair and complexity in terms of flavour and texture and yet, the simplicity of it as a whole is what makes it so special. 5 Mercer Street in downtown Toronto, between King Street West and Wellington St. West, just west of David Pecaut Square and Roy Thomson Hall in the Entertainment and Theatre District. They are open 7 days a week from 11:30am-10pm Monday-Wednesday, 11:30am-10:30pm Thursday & Friday, 3pm-10:30pm on Saturdays and 3pm-9pm on Sundays. 783 Queen Street West by Trinity Bellwoods Park, between Euclid and Manning Ave. west of Bathurst St. They are open 7 days from 5pm-10pm Monday-Wednesday, 12 noon-10pm on Thursdays, 12 noon-11pm on Fridays and Saturdays, and 12 noo -9pm on Sundays. 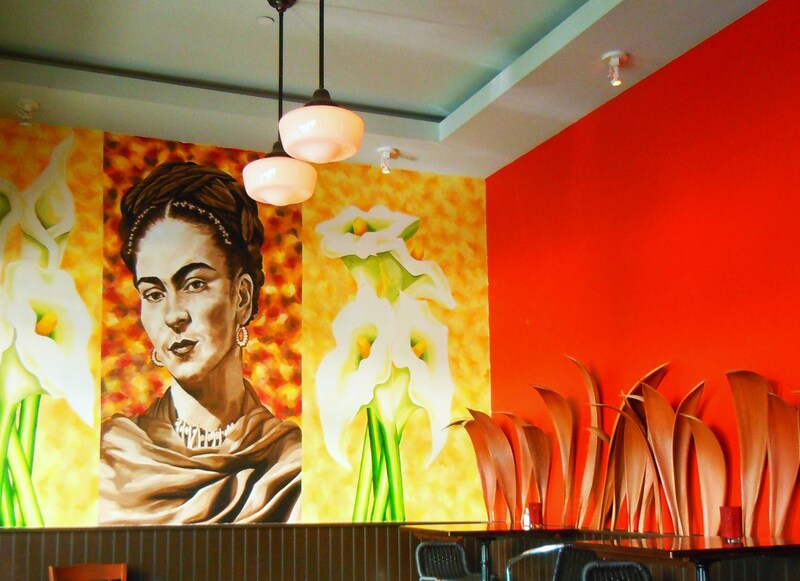 The Queen West location serves weekend brunch! 3187 Yonge Street in uptown Toronto, north of Lawrence Ave. by Ranleigh Ave. They are open 7 days a week from 5pm-9pm Monday-Wednesday, 12 noon-9pm on Thursdays, 12 noon-10pm on Fridays, 2pm-10pm on Saturdays, and 2pm-9pm on Sundays. 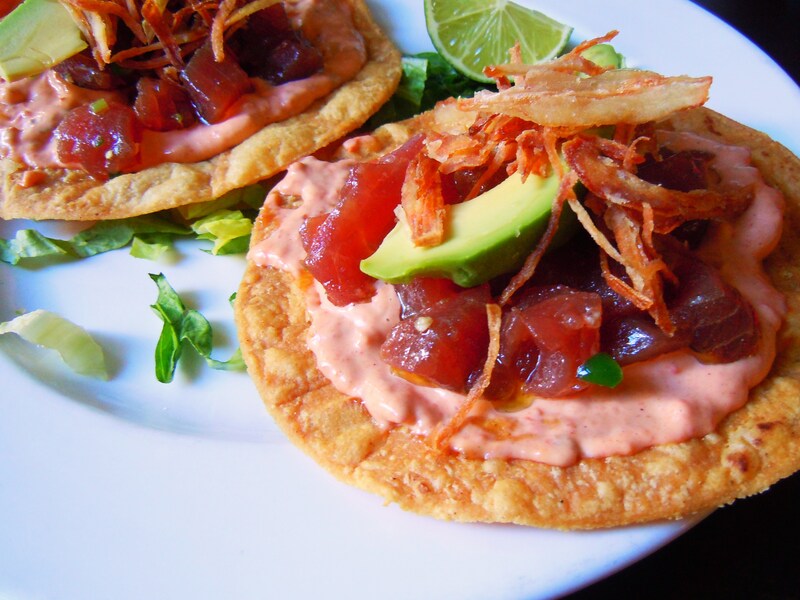 A Life-Long HG – The Remarkable Rare Tuna, Chipotle Mayo Mexican Tostadas at Milagro Cantina Mexicana, Part I! Your heart fills with joy. You can’t stop thinking and gushing about it. And as soon as it’s over, you can’t wait to come back for more. It’s the ultimate in first dates…with food! Call it infatuation, call it true love; when you’ve found a holy grail place to eat, nothing else comes close. It is truly one of the best feelings in the world when you finish a delicious, wonderfully foodgasmic meal and think, “Can I live and eat here for the rest of my life? !” Maybe taking up residence is a little unreasonable, but solidifying an eatery as a life-long dining destination is not. We all have them. Those go-to places that we keep going back to over and over again because they are just that damn good. Maybe it’s the diner around the corner from your house. Maybe it’s a bakery in the next town over. Or maybe it’s that fancy place in the city that you’re more than happy to splurge your hard-earned wages on several times a year. Wherever the place may be, it’s a place that makes you happy, excited, and probably pretty darn full by the end! 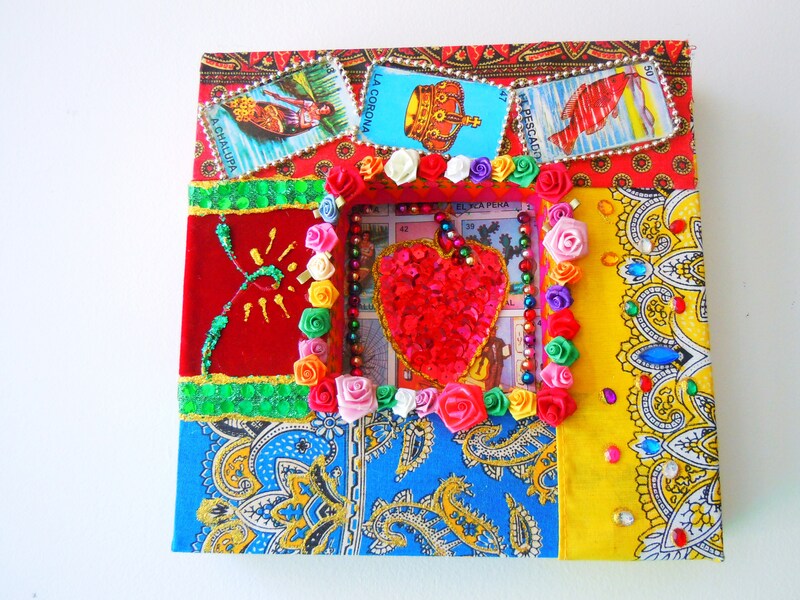 My group of favourites will need to make room for a new member because Mexican powerhouse, Milagro Cantina Mexicana, has smoldered its way into my heart and into my list of holy grails! 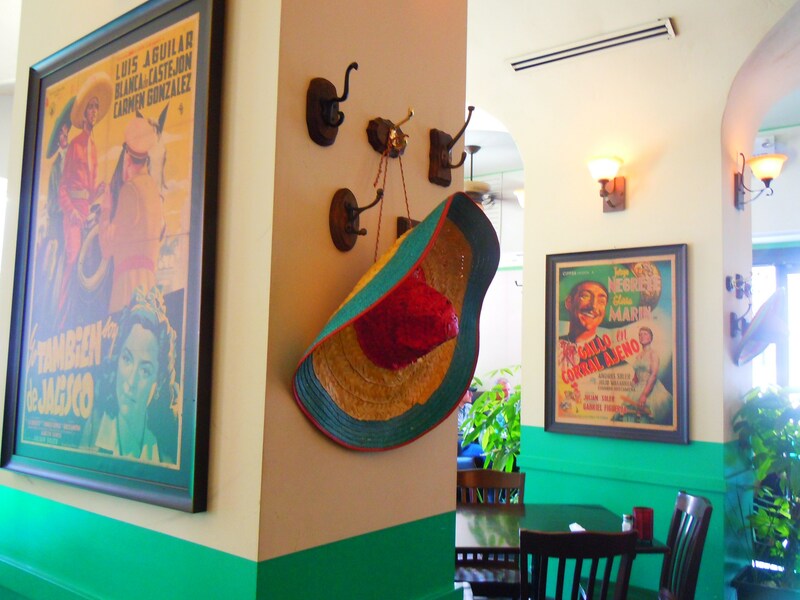 Milagro, located smack dab in the downtown core at 5 Mercer Street between King and Wellington (with two other locations in Toronto), is a Mexican food lover’s dream. Not only is their menu incredibly reasonable in price (a possible $12 for dinner?! 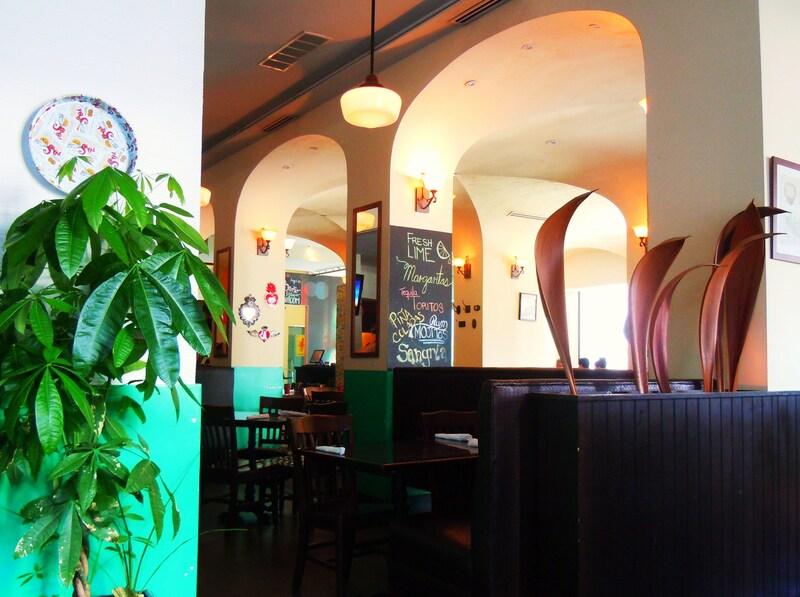 ), it is also a treasure chest of regional Mexican dishes and ingredients that speak to the diversity of Mexican cuisine and culture: red snapper ceviche with mango and serrano; Tijuana caesar salad, Yucatan pulled pork in achiote; Michoacán style braised pork; Pachuca style lamb slow roasted in a banana leaf; and LOTS of mouthwatering favourites including Oaxaca cheese, fresh corn tortillas, tostadas, enchiladas, burritos, and so much more. One very memorable moment during my first visit to Milagro was what my server said to my boyfriend and I. 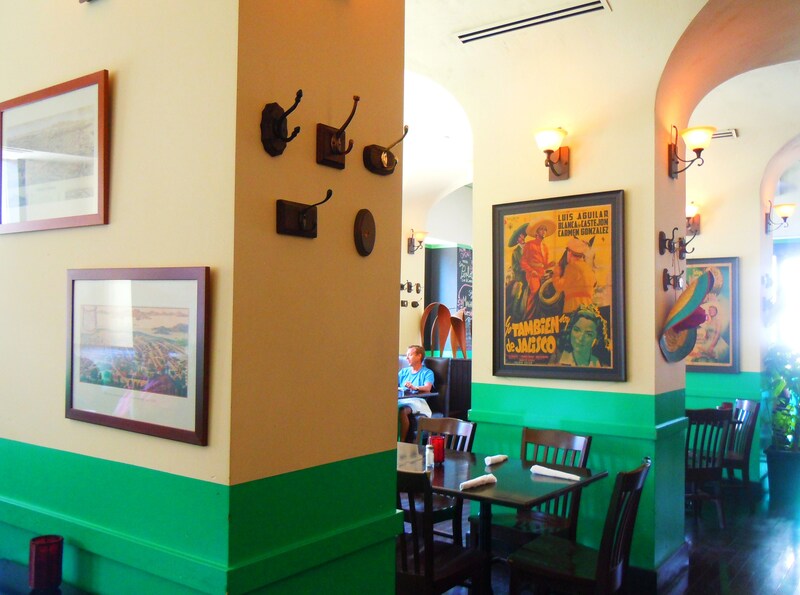 He asked, “have you ever been to Milagro before?” to which we replied no, it was our first visit. “Well, you’re in for a treat then!” Words have never rang more true. They are so, so committed to bringing authentic flavours, dishes, and ingredients to the table and it is mind-blowing how delicious their food is. 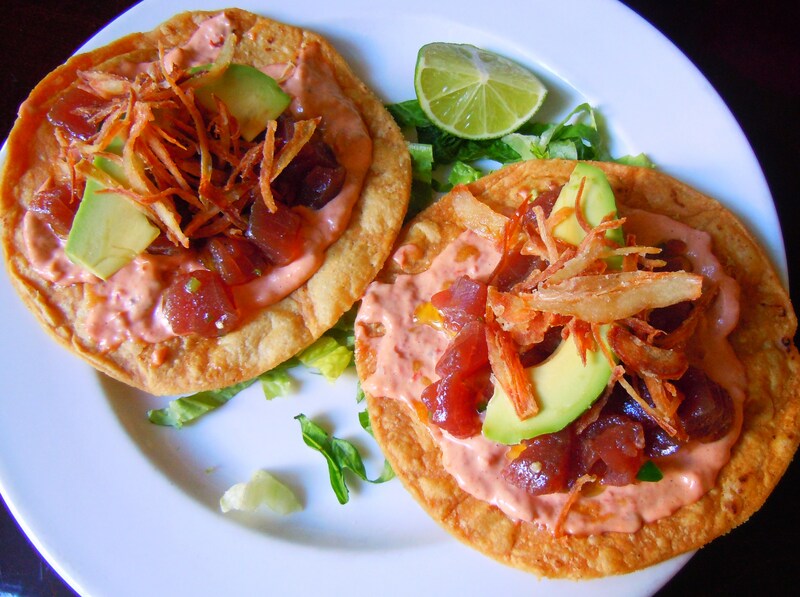 Gone are the stereotypes of Mexican food as being a one-track taco machine. Milagro doesn’t just banish them – they chew them up and spit them out. What makes me so revved up is their variety. And their prices. Sure, there are some $18, $19, and $20 items on it, but a majority of their dishes fall under the $10-$15 bracket and for authentic Mexican food at this level of quality and quantity, it is beyond worth it and absolutely affordable as a life-long holy grail. 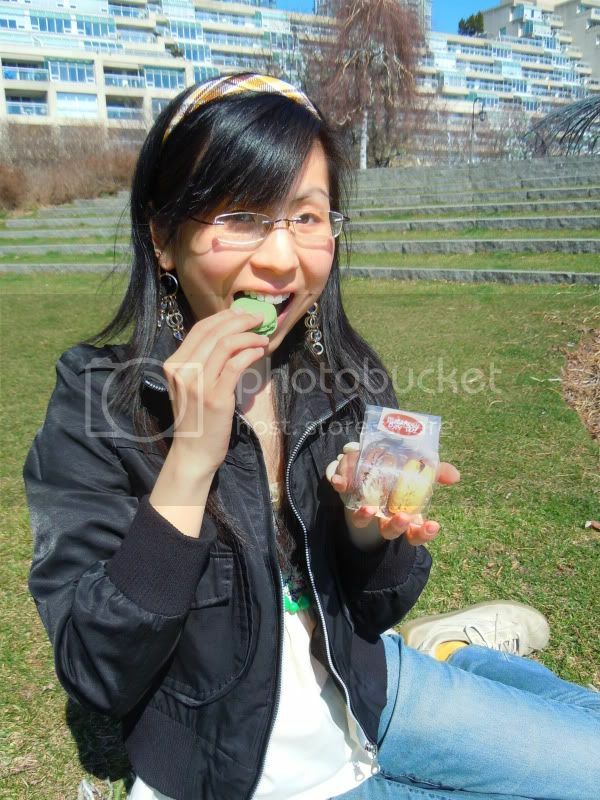 And the variety of food is remarkable – if you’re a meat-eater! I’ll preface this by saying that while there are some vegetarian options, there aren’t many, so just keep that in mind if you’re vegetarian or if you have vegetarian friends you enjoy dining with. Their variety lies in the different types of meat and their cooking styles. Seafood (snapper, shrimp, rare tuna, octopus), rib-eye, lamb, chicken, pulled pork, and chorizo in grilled, marinated, slow cooked and roasted forms are just some of what you can find on the menu. Everything about their food is spot on. Their portions are fantastic (my boyfriend could only comfortably finish half his burrito. And he’s a boy! ), their ingredients are so, so fresh, and EVERYTHING has a spicy kick in the pants. There’s even a disclaimer on the menu warning everyone that the food is spicy! If heat is your foe, don’t freak out. It’s not “oh my dear god, I need a fire extinguisher in my mouth!”, it’s more like, “woo, that is some damn good stuff”. Insert a few gulps of water and puffs of air here. Trust me on this one. My heat tolerance is at medium-strength and while there was definite spicy kick in every single bite of food, the heat doesn’t linger for very long. A few minutes later, the sensation was gone for me and I had completely forgotten that I had downed half my glass of water. You’ll feel it at first, but it’s the type of heat that makes eating spicy food fun, not painful. 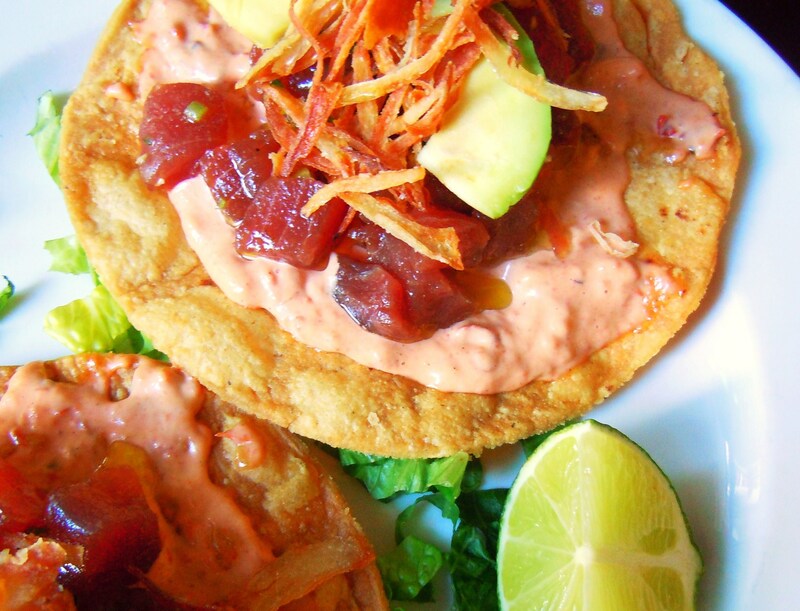 For my first visit to Milagro, I went with the Tostadas De Atun ($12.95): crispy, crunchy corn tortillas in the shape of round disks piled high with fresh diced cubes of rare tuna and thick wedges of avocado, smothered in chipotle mayo with crispy fried onion on top. You know, the stuff you normally get on a traditional dish of meatloaf. Anyway. OH.MY.GOD. MULTIPLIED BY A MILLION. !!! I would continue on with the exclamation points but I don’t want to hurt anyone’s eyes so I’ll leave it at three. BUT OH MY LORD. This ranks in my Top 10 of best dinners ever. Possibly even Top 10 best dishes in general. This was SO, SO delicous and scrumptiously good. The rare tuna was so soft and moist, the crunchy, crispy strands on top gave the dish a punch of salty savouriness, the tortillas were so full of warm corn flavour and if I’m not mistaken, the tostadas were drizzled with some olive oil that, combined with everything else, created a dance party in my mouth. And the mayo. OH MY GOD THE CHIPOTLE MAYO. The mayo, in combination with the mouthfuls of creamy avocado and cubes of tuna was unbelievable. The mayo made this dish. It was creamy, spicy, and honestly something I’d spread on just about anything and everything. 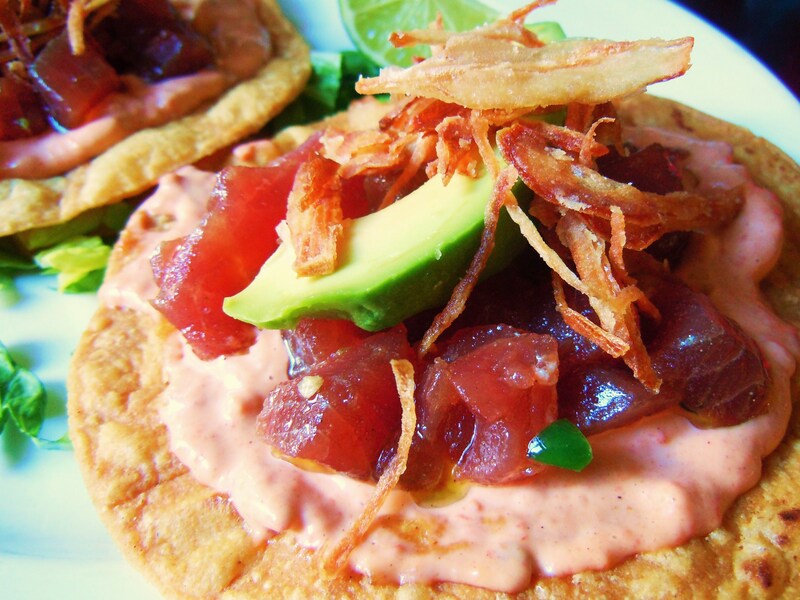 I could not get over how delicious these rare tuna tostadas were. And how they reminded me of sushi! With the exception of the tortillas and crunchy bits, it was almost as if someone had deconstructed the most amazing spicy tuna and avocado rolls with spicy mayo and placed the mountain of goodness on Mexican corn tortillas. Purely fantastical. And to cap off one of the most amazing dinners in my life? Why, Mexican dessert of course! That’s for tomorrow. What can I say, I like to be a bit of a tease. When it comes to good food, it is so worth the wait.